Now that the dust has settled after the Olympics, Rio de Janeiro is swinging back into its beguiling rhythm of sun, sea and carioca-fuelled nights. Just in time, in other words, for the splash down of Yoo2 on the shoreline of Botafogo, a beachfront neighbourhood known for its artistic communes and boutiques. In-house YOO Design Studio has dressed the 143–room hotel in a calm palette of light woods, tessellated wall and floor tiles, graffiti murals, and a subtle botanical theme by way of palm-printed ceiling-paper and garden walls. 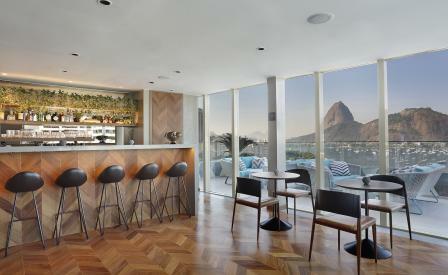 The views – best experienced in the glass lifts, bar, and rooftop pool – are oriented away from the neighbourhood’s skyscrapers towards framed panoramas of Guanabara Bay, Sugar Loaf Mountain and Christ the Redeemer. Though the neighbourhood bristles with dining options, chef Marcelo Shambeck tempts with local flavours, including slow cooked ribs, and grilled octopus served with jumbo rice and tucupi sauce.